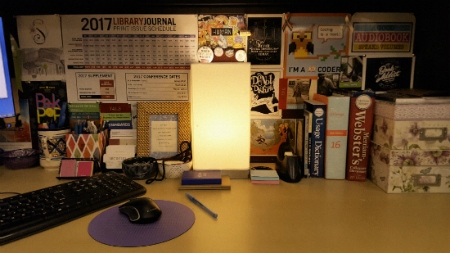 I try to make my cubicle as inviting as possible. Many of the decorations are items I picked up at conferences. I love pins and rotate the pins above the lamp on a regular basis. There are also Walking Dead passes from NYCC and lots of ribbons from ALA, although many ribbons are hidden behind other things. Of course, I always keep the 741.5 ribbon visible, and the I Have No Purchasing Authority ribbon is on the left side of my monitor. It gives me a good laugh during stressful days. The “S” in the left corner is stationary from Virginia Alexander Cononie (@sketchlibrarian); I thought it was too pretty to mail to someone else. Although it isn’t picture, to the left of my monitor is also a diagram of opening lines from novels from Pop Chart Lab. It’s always a conversation starter. I still use a paper planner. I find that I can better organize and schedule my days if I write everything down. That said, I also use Google Keep for last-minute notes and reminders when I’m on the go. Sending and replying to emails. I’ve learned that written communication skills are essential in our field. It varies. Some days are mostly editing (either reviews or articles) while other days are filled with meetings. Some days are spent browsing incoming books, while others are spent writing articles and/or conducting Q&As with authors. And, as those who follow me on twitter know, I go to a lot of book buzzes and I tweet about upcoming books. This might win the award for the longest book title: The Awkward Thoughts of W. Kamau Bell: Tales of a 6' 4", African American, Heterosexual, Cisgender, Left-Leaning, Asthmatic, Black and Proud Blerd, Mama's Boy, Dad, and Stand-Up Comedian. Seeing him speak at ALA Midwinter was a conference highlight. It’s been said several times before, but being reminded that many people are nervous or afraid to come to the library, and a little kindness can go a long way. Also, always plan for interruptions and the unexpected because life (personal and professional) rarely goes according to plan. When I was a public librarian, I never expected to be designing and distributing handouts on how to use Microsoft Word, Excel, and PowerPoint. It was surprisingly fun, and a great way to connect with patrons who ordinarily wouldn’t stop by the reference desk. In my current role, I never expected to receive so many press releases on a regular basis. Encyclopedia, if only because it was the first “big” word I learned how to spell. I’ve never been a fan of the term, guybrarian. Sometimes I wonder about selling candles professionally again, but running your own business is tough (and exhausting). I’ll have to borrow Megan’s answer of instant healing from injuries. As a librarian, it was often the little things people would say: a teen geeking out with me after learning that I like comics too, a student stopping by the library to say that they aced their report after we helped them find databases on a given subject, or even someone saying they were no longer afraid to come to the library thanks to our warm welcome. Those moments have always meant a lot to me. I know that many other librarians have similar stories too. It’s moments like those that help us know that what we do makes a difference. I think my biggest work-related mistakes involve saying yes to everything, becoming overwhelmed, and being afraid to ask for help. Now, I’m no longer afraid to reach out when I need additional support. Besides reading? Usually candle making, jewelry making, cooking, baking, or developing recipes. (In a previous life, I ran a baking blog.) I’ve also been returning to embroidery after a long hiatus. I’ve always enjoyed arts and crafts of almost any type. Stephanie is on Twitter as @sendaulas.